Finished Size 33 (35, 36¼ , 40¾ , 44, 48¼ )“ bust circumference. Sweater shown measures 35”, modeled with minimal positive ease. Yarn Naturally Harmony 8 Ply (100% merino; 136 yd 125 m/50 g): #702 brown, 8 (8, 9, 10, 11, 13) skeins. Yarn distributed by Trendsetter Yarns. Body and sleeves—size 5 (3.75 mm). 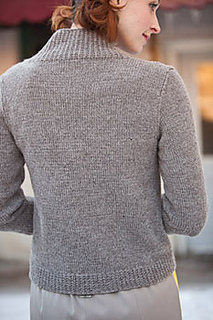 Ribbing—size 4 (3.5 mm): 36–40” circular (cir). Gauge 22 sts and 30 rows = 4” in St st on larger needles.